Elder Larry Grant has had the tendency to just fall into the jobs he has had throughout his life. It’s been “serendipitous,” according to him. From being a longshoreman on the ports at Strathcona to a heavy duty mechanic, and then an adjunct professor of hən̓q̓əmin̓əm̓ at UBC and Elder-in-Residence at the First Nations House of Learning, Grant has only been unemployed for five days since 1955. 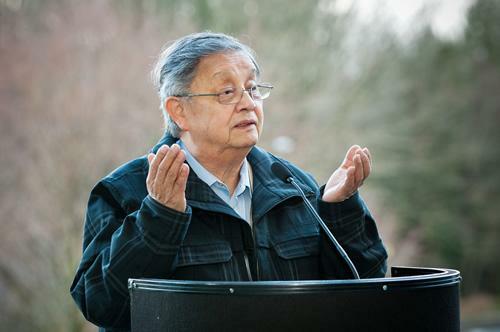 In his most recent role as adjunct professor and Elder-in-Residence at UBC, Grant has worked to build and strengthen the Musqueam presence on campus and to talk to students about Musqueam culture. “It took me a while to realize that the role of the Elder-in-Residence is multi-faceted. It’s there as an ambassador for Musqueam, it’s there as a grandparent figure for students because they call the House of Learning ‘home away from home’ and it’s a safe space,” he said. The role has grown beyond just a figurehead position throughout Grant’s tenure. “It’s more than just saying a prayer, saying a welcome, and going home,” he said. Through his position, Grant has been involved with the First Nations education standing committee, the UBC president’s advisory committee on Aboriginal issues, and the Musqueam UBC development committee. He also provides Musqueam welcomes for events and occasional guest lectures. Of all the different aspects of the role, Elder Grant said that his favourite part is interacting with students. Often this involves helping Indigenous students navigate the challenges of Canada’s current legislation as well as the history of the residential schools, which still affects the community today. “I know the schools have been closed now for about 20 years, but there’s great-grandparent, grandparent, parent generations that have been in residential schools,” he said. He sees the impact of the intergenerational trauma when teaching in the First Nations and Endangered Languages (FNEL) program as students battle old demons of being forbidden to speak their mother tongues — or even the feeling of being in a classroom. “In a small way, through the language program we’re able to help students through the trauma that has been created by those prohibitive legislations,” he said. Grant himself did not attend residential school, but this was due to the fact that he is half Chinese and half Musqueam. Under the law at the time, Grant was considered Chinese. He recalled feeling conflicted about his dual identity as a child, because he had lived mostly with his mother and grandparents who were Musqueam and spoke hən̓q̓əmin̓əm̓. Still, his documentation said that he was Chinese and the people around him considered him Chinese. “But I know nothing of Chinese culture [or] Chinese identity,” he said. At home was where he felt most comfortable with his dual identity. “My grandfather’s generation accepted us as Musqueam children, whether or not we were a hundred percent Musqueam,” said Grant. Growing up, he was not encouraged to learn hən̓q̓əmin̓əm̓, but he remarked on the importance of the language to him now. It is because of this cultural relevance that he is passionate about the revitalization of the hən̓q̓əmin̓əm̓ language, especially by giving the language both cultural and historical context. The UBC FNEL program also works with archivists and First Nations languages specialists to create curriculum for teaching the language. The restoration of hən̓q̓əmin̓əm̓ and the increasing awareness of Musqueam have the potential to be immensely empowering to the Indigenous community on campus, according to Grant. Moving forward, he hopes that the community can gain the equal respect of the university. “It’s not putting Indigenous concerns in a special space — it’s putting Indigenous concerns and recognition on an equitable, even footing on campus,” he said.